Atelier Kiki: I love Etsy! This is so much fun! When we came back from our trip to Vancouver, there were quite a few packages from Etsy stores waiting for me. Such a treat to open all of these envelopes to see what amazing creations crafters from all over the world sent. On the left you see gorgeous handspun yarn by hobbledehoy (Liz), she's a super spinner who works and lives with her Angora rabbit in Pennsylvania. I just love her choice of yarn and colour combinations. Very funky and very soft. I can't wait to get started! In the centre of the couch there's two stunning scarves by Kelgwo, a small textile studio on Chiloe island in the south of Chile. These are a true work of art. Beautiful yarn combinations and raw wool. And on the right some funky fabrics by Lucky Kaeru in Southern California. I can't wait to see what these will end up as.... I guess I'd better get started. The world becomes a small place on Etsy. It feels good to support fellow crafters and it feels even better to work with their materials. Knitting with Liz's yarn makes for a true craft collaboration. Hi Kiki, I came across your blog this morning as I was searching for wool felt supplies. Anyway, I like the links you have under inspiration. I also like the work you've done in felt. I felt but I knit first. Hoping to do your kind of felting in the new year. Laura. lovely finds . 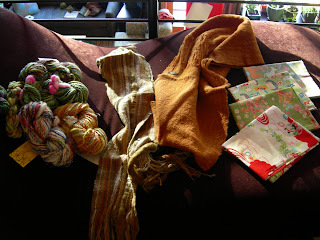 . . receiving snailmail is always so much fun, isn't it, especially handmade goodies. what fun!! i love those mail days. Ooh that yarn is just delicious looking. I want to pet it!